I hate to be the bearer of bad news, but Cook Islands (a real country), in conjunction with "National Collector's Mint" (apparently a sham operation), have created a new brand of collectible coin that purports to be a 1/10 ounce gold coin. They refer to is as ".24 pure gold" -- to make it seem like it is 24 karat gold (which would be pure), but it is actually 24% gold (not 99.9% or more). They are copper coins with a bit of gold mixed in (I won't lie -- they might be made mostly of zinc, nickel, or some or metal, but the majority of the metal is not gold). So that "1/10 ounce" gold coin actually contains only .024oz of gold, or 1/41 ounce, much less than the .100oz it purports to be. It is clear that these coins were designed to fool people into believing that they contain 1/10 ounce pure gold, but they do not. These are not even gold coins (they likely contain more copper than gold). What Are 1/10oz, 1/4oz, 1/2oz and 1oz Gold Coins? The history of fractional gold coins starts back in 1967, when South Africa minted 1 ounce gold Krugerrands. 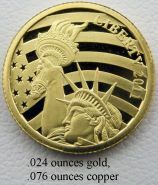 They stated "1OZ FINE GOLD", and were made of 1.09 troy ounces of .9167 fine (22 karat) gold. The coins weigh well over 1 troy ounce because the gold is not pure, but if melted, you would get 1 troy ounce of pure gold (in addition to .09 ounces of copper and other metals). In 1980, South Africa introduced fractional gold coins, which state "1/10 OZ FINE GOLD". Similarly, they weigh 1.09 troy ounces, and since the gold is .9167 fine, they contain a full 1/10 troy ounce of gold. China followed in 1982 with the popular panda series, and many other countries have produced fractional gold coins (as well as fractional coins in other precious metals, such as silver, platinum, and even palladium). How Much Gold Does a Real 1/10oz Gold Coin Contain? All real gold coins contain the amount of gold stated on them. Many gold coins are .999 or .9999 fine. These coins weigh slightly more than the stated weight, so that they contain at least the full amount of gold stated. Other gold coins (such as Krugerrands and U.S. Eagles) are made from .9167 fine gold (22 karat), where 91.67% of the metal is gold, with the rest consisting of other metals (such as copper and silver). Like with the Krugerrand example above, these contain enough extra weight to ensure that you are getting the amount of pure gold listed. The obvious: All 1/10 gold coins marked "1/10 OZ" (or "1/10 OUNCE") have an actual gold content of at least .1000oz of gold, except these bogus Cook Islands '.24 gold' coins. Purities are shown as millesimal fineness, e.g. "999", ".999", or "999.9". Millesimal fineness is precious metal parts per thousand, which requires at least 3 digits, so ".24" is not in the correct format ("240" or ".240" or "240.0" or ".2400" would be acceptable). How Much Gold Do These Coins Contain? I will assume that they contain .024 ounces of gold. It is impossible to say for certain, since  they refer to the gold as "pure" (but it is not pure gold in any sense of the word),  they show the fineness as '.24' which is not a valid millesimal fineness (I'm assuming that means '.240', although in both math and the gold world that is a different number than .24),  they do not use the extremely well-established weight system (all other 1/10 ounce gold coins contain at least 1/10 ounce of pure -- as in 100% -- gold if melted, regardless of their purity), and  they are being intentionally deceptive (what a layman would likely consider fraud, although legally it may not be). There is a very good chance that these really do contain .024 ounces of gold. On the other hand, it's kind of like the guy on the street corner selling watches out of his trenchcoat, who admits one of them is fake, but swears the others are real. Do you trust him? With that out of the way, if I saw one of these for sale at spot (the price of gold per ounce times .024), I would consider buying some. Unlike other 1/10 ounce gold coins issued by countries, I would pay no premium beyond that. It is important to remember that these are base metal coins with some gold in them, so melting them would likely be more expensive than melting pure gold coins. Note that I would not consider bidding on these on eBay, as the increased bidding just helps the victims (the people thinking these are worth more than 4 times what they are really worth) enter their high bids. UPDATE: I have heard from someone with an XRF machine that these are indeed 24% gold (5.76 karat, or .240 pure). All real fractional gold coins state the actual gold weight (AGW), not the gross weight. Someone intentionally chose to use the gross weight, not the actual gold content. It sounds like they tried to stay within the law by marking it as ".24 pure gold" (a nonsensical term; the United States doesn't allow jewelers to mark anything under 41.67% gold as gold, so calling it "pure gold" is nonsense). The term "pure gold" refers to the hypothetical amount of gold in something that would exist if all impurities could be removed (which is nearly impossible to do). If a country accidentally marked coins made from 24% gold as "pure gold" or ".24 pure gold", or accidentally marked coins as "1/10 oz" of gold if they did not have actual gold content of at least 1/10 oz, the country's coins cannot be trusted at all. If a group of people don't understand those basic concepts, how can you believe that the 24% of the coin that is supposed to be gold is really gold, and they didn't get duped? So the next question is "Why did they choose to make these out of 24% gold?" The obvious answer is to defraud people, by making them think they are 24k gold. Why else pick 24% rather than 25% (6k gold)? This is likely the first ever coin minted in 24% gold. Next, we ask "Why did they choose to mark it as '.24' rather than '240' or '.240'? The proper formats for marking the millesimal fineness of gold are '240' (preferred; indictating 240 parts gold per 1,000) or '.240' (a common alternative format, e.g. 240/1000). By removing the trailing '0', it no longer indicates millesimal fineness (which, by definition, involves thousanths). This is a made-up "centessimal fineness". The obvious answer for why the removed the trailing zero is that people would see ".240 pure gold" or "240 pure gold" and have no clue what the product was. But newbies see ".24 pure gold", and they think "24 karat pure gold". Finally, what possible reason could a country or company have, other than profit motive, to go to such great pains to make a coin that is so similar to a real 1/10 gold coin but with only 24% of the gold needed for it to be a real coin? Are People Fooled by These? The value of fractional gold coins consists of 3 components:  the gold value, and  the collector value, and  the dealer markup. With gold at $1,300/oz, a 1/10oz gold coin will typically sell for around $150-$160. There are some exceptions for proof coins and other coins with a high collector value. But there is little, if any, known collector value to these coins. As I write this, ncmint.com is selling 1/10oz gold Eagle coin for $189 (with spot at $1,332.40), or a markup of about 42% over the gold content. 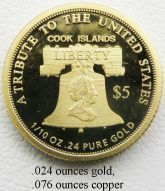 They are selling 1/10oz ".24 pure gold" Cook Islands coins for $99, with a markup of 310% over the gold content. They limit you to ordering a maximum of 5 (it's unclear if that is to fool people into thinking it is a loss leader, or if it is to help ensure that people don't order enough to make it worthwhile to sue them). But the real proof that people are fooled by these is eBay: unscrupulous sellers are selling, and looking at the past 10 actual auction sales (not including one oddball price), 1 went for fair value ($26.00), 3 went for a few dollars below the price at ncmint.com ($.50 to $3.50 less, so obviously people who assume the ncmint.com price is 'fair'), 6 went for 7%-14% above the value of an actual 1/10 ounce of gold. 9 out of 10 of the coins sold went for over 3 times the value of the gold! Fill in the Order      Angela Marie (Bay) Buchanan          Barry M. Goldwater, Jr.
First, note that the ".24 Fine" may be read as "24 Fine" given the dots leading up to it (it seems that every detail was well thought out!). Notably, the COA purports to be created by National Collectors Mint, not Cook Islands. People buy bullion coins primarily for the gold content. If the owner of a gold coin was told, "Would you rather find out that your coin is made of copper but truly made by the country you think it was made in, or find out that your coin is really gold but made by an unknown company or government? ", nearly everyone would choose the latter. So a COA for a bullion coin that states the weight as anything less than the actual precious metal content is intentionally deceptive. How Can I Honestly Sell These? First, I'm sorry if you got one of these thinking it contained 1/10oz of pure gold. You should not write ".24" -- it would need to be ".240". If you want to quote the ".24" in places, that's OK -- just so long as it isn't in the title (unless it also has .240). Also be sure not to write "24k", as (depending on the context) it would very likely be fraudulent. Do not use the word "pure", as these are not pure gold. "Purity" is OK to use (e.g. ".240 purity"), "pure" is not ("pure" refers to 100% gold, or the amount of gold you would come up with if you melted them). Like with ".24", it is OK to carefully quote what is written on the coin/COA, just so long as it isn't in the title, and you are clear that the word "pure" is being quoted from the coin. Do not set a selling price or "Buy It Now" price that is suggestive that it contains 1/10oz gold. What you really want is to be sure that someone reading your title/description is going to understand (even if they are in a hurry to buy some gold quickly) that they are not getting a traditional 1/10oz gold coin, and that these only contain .024oz of gold.